Even though the weather seems to be good, an awning should always be fixed tightly to the ground. Our awarded Fix&Go Anchor Plate 2.0 will be a perfect solution. 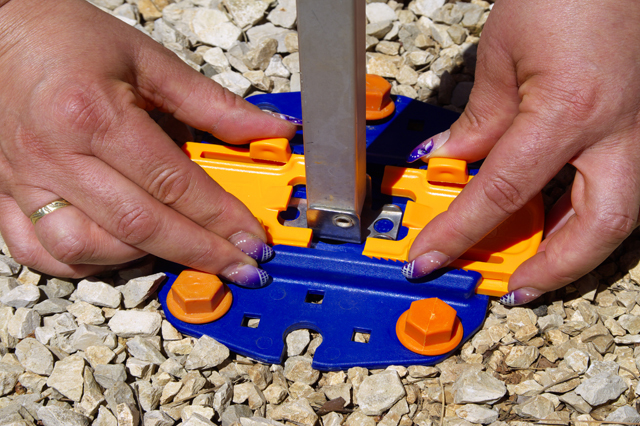 While setting up your awning you simply put each leg in one of our Fix&Go Anchor Plate 2.O and lock them in positon. The advantage of this product is that you can quickly retract the awning legs again by only opening the sliders. Plate and locks were designed to suit to almost every kind of awning and tent poles. With the two orange sliders you can quickly secure or unblock them in just seconds. You can use every peg of our whole range to fix the plate. Peg&Stop works on almost every ground in combination with their lock nuts. The flat plate offers a bigger area of support, awning legs or tent poles won’t sink on sandy ground anymore, only take two Peggy L screw-in pegs.